“When we talk about mapping, we remember that anything we do is an overlay,” says Cannupa Hanska Luger. 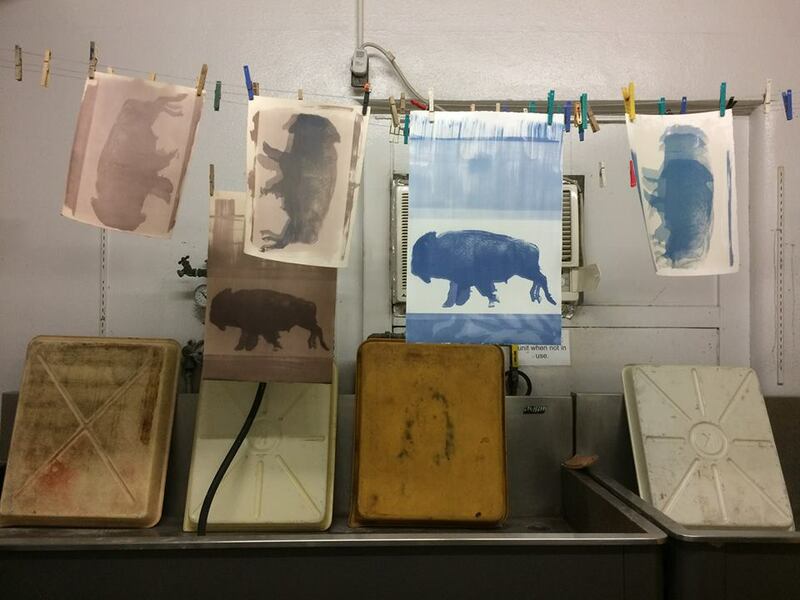 Established in 2009, Map(ing) — Multiple Artists Printing (Indigenous and Native Geographies) — invites Native American and Indigenous artists from across the United States to work with students in ASU School of Art’s nationally ranked printmaking program to create editioned prints. The twist? The invited artists are not printmakers. Each artist works with a team of student printmakers (both graduates and undergraduates) over a 10-day time span to generate a piece of art in a medium that is brand new to them. The students effectively become the guides for these well-established artists. In celebration of the 10th anniversary of the project, this year’s work is on display, alongside the pieces from earlier iterations of the project, in a six-month-long exhibition at ASU Art Museum. “The exhibition is being presented within the context of our Spotlight series, highlighting faculty research and how these larger projects reflect their own artmaking, research and expertise, and their impact on student learning and experience,” says Heather Sealy Lineberry, senior curator and interim director at the museum. Artist Brenda Mallory works on her Map(ing) piece with students Jonathan Wright and Kelsey Reiman. This year was artist Sarah Sense’s second time participating in the program. “I have never been pushed like Mary Hood has pushed me to explore new material,” she says. Sense’s own artistic practice involves photography and traditional Chitimacha basket-weaving techniques, but she says some of the techniques she has learned through the project have become integrated into her regular art practice. Another of this year’s artists, Brenda Mallory, usually works in 3-D. Still, she says the print she created with her student collaborators maintains some through-lines with her sculptural artwork. “It’s different from anything I’ve done, but it looks like my visual language,” Mallory says. Artists and students are not restricted in terms of content. But much of the resulting artwork has to do with Native American and Indigenous culture and identity. Since the inception of Map(ing), ASU Art Museum has brought the resulting artworks into the collection, serving as an archive of the project. When the prints are not on display in the museum, they are housed in the museum’s Print Study Room, which is open by appointment to students, classes and the public for close study of the work. Map(ing) will be on view at ASU Art Museum through June 17. For more information, visit asuartmuseum.asu.edu. Arizona State University’s Walter Cronkite School of Journalism and Mass Communication is accepting applications for an all-expenses-paid workshop this summer for recent college graduates interested in launching careers in media sales. Up to 30 fellows will be accepted and will receive NABEF Media Sales Certification as well as transportation, housing and meals at no cost. Recent and soon-to-be college graduates can apply at http://nabef.org/msi/registration.asp. 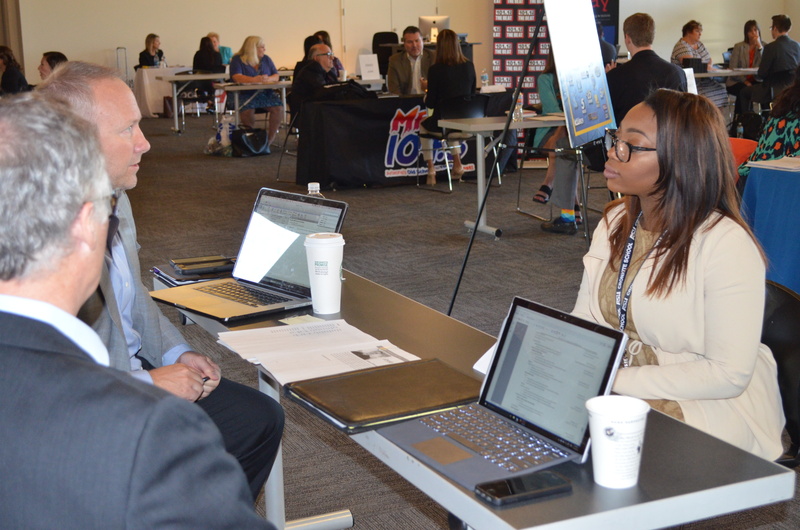 The Media Sales Institute includes sales-training seminars, mentorship and networking opportunities with leading industry professionals, as well as a job fair at its conclusion where attendees will interview with more than 20 local and national media outlets. Past graduates of the institute have gone on to work at broadcast sales positions for companies including Cox Media, E.W. Scripps Co., Hearst Television, Raycom Media, Sinclair Broadcast Group and TEGNA. Paige Charday, who graduated from MSI in 2016, said the institute helped her land a job as an account executive at FOX 5, KVVU-TV, in Las Vegas. This marks the fourth year the Cronkite School is hosting the Media Sales Institute, which features sessions with seasoned media sales executives such as Margie Albert, a 30-year award-winning media professional who co-directs the program with Cronkite Assistant Dean Mark Lodato. ASU is one of only three select institutions to host this event. Florida A&M University and Howard University are the other universities holding Media Sales Institutes in 2017.